The candle that flickered in Laura’s hand cast ghostly shadows across her face. Her eyes, wide with fear, shone eerily in the light. The rustling of a skirt, a muffled cough, and a hushed whisper betrayed the presence of others. Out there. In the dark. Mace waited. Her real name was Martha Heiden. Down in the cave, though, she went by Mace. Like the spice. And the weapon. She was sixteen years old. Mace was one of the discarded, the unwanted; the girls who had been tossed aside like so much garbage. Laura was one of them. Laura’s cheek, fascinated by the way it glistened in the can-dlelight. It seemed so inexpressibly sad. Enough, she thought. It was time. "Laura," Mace said. Her voice was soft and tender as it echoed off the stone walls. Laura jerked and almost dropped the candle. The flame guttered, but held. She turned in the direction of the voice. "Laura," Mace said, "we have brought you here tonight to ask you to join us. Now that you are twelve, we feel you can be trusted with secrets. Our secrets. Are we right, Laura, can you be trusted?" "Never mind that for now. All we need to know is can we trust you?" "Yes. I mean no. Oh dear," Laura said. "Well, which is it?" Mace asked. A hardness crept into her voice. "Oh dear," Laura repeated, her face earnest in the glow of the candle. "You see, I’ve never been asked to keep a se-cret before but I’m sure I could. It’s just that I couldn’t promise to keep a secret if it meant harm to someone. You do see, don’t you?" Mace smiled. "Yes, Laura, we do see and that is exactly the correct answer." Laura’s shoulders relaxed a little and some of the fear left her face. Mace was pleased. They had chosen wisely. "We promise you, Laura, that we will never ask you to keep a secret that will bring harm. Just the opposite. We do only good. But it is good that must never be discovered. Do you swear never to tell anyone what you learn tonight?" Laura nodded. "Yes, I swear." "Then, just next to you, a little to your right, you will find a table. On the table is a Bible. Put your right hand on the Bible." Laura turned and, holding the candle out in front of her, groped in the dark. Finally, she found the table and the Bi-ble. She reached out her hand and placed it gently on the cracked leather cover. "Now," Mace said, "repeat after me: I, Laura Lincoln, on this thirtieth day of September in the year of our Lord, 1883…" She waited while Laura repeated the lines. "…do solemnly swear that I will never tell a soul anything about this place, these people and what we do, for as long as I shall live." Laura gave a little shudder as she repeated the last line. A lantern appeared at the back of the cave held aloft by a thin bean pole of a girl named Gertie. She stepped down into the doorway that had been carved into the stone wall. Gertie gave a low whistle and cocked her head backward toward the stairs that disappeared up into the gloom. This was the signal that Miss Fassberger—known as Miss Fuss-budget to the girls—was stirring in her bedroom next to the dormitory. Mace stepped into the circle of candlelight and took Laura by the elbow. Laura let out a little squeal as she rec-ognized her. Mace put a finger to her lips and said, "Quick, it’s old Fussbudget. We must get back to the dorm and into bed before she finds out we’re gone." They tiptoed over to the door and silently followed the other girls up the stairs to the Home for Abandoned and Orphaned Children. The Home was perched high above the cave on a cliff overlooking the Mississippi River. 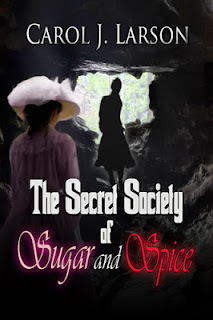 "Oh, by the way," Mace whispered, "welcome to the Secret Society of Sugar and Spice."